NASTAR Team Racing is a great way for friends and family members, Clubs or Resort Teams to compete as a team during the season regardless of when and where they race. Each time a team member races NASTAR they score points for their team. Participants don't need to race on the same day or at the same location to score points for their online team! The NASTAR web site keeps track of team scores based on each participant's best handicap earned during the season and ranks each team. Family/Friends Team – for small teams with the top six point gainers scoring points for their team. Club Team – for larger groups and allows for ski clubs or other groups to compete as a team with the top 15 point gainers contributing to the team score. Resort Team – for participants that would like to represent their favorite resort with the top 20 point gainers contributing to the team score. NASTAR participants call add or change their team(s) when they login to their NASTAR record by using the Update/Edit Personal Information option. NASTAR Team points are calculated based on a process of interpolation. 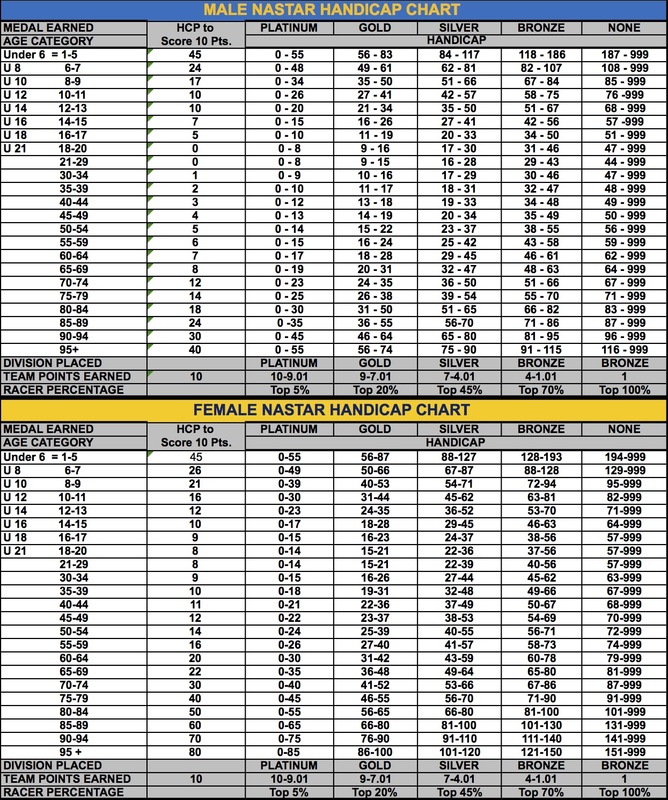 The handicap chart shows a range of points that can be earned within each age and gender group which is the minimum and maximum number of team points available based on the handicap earned. Team members score points based on where their handicap lies between the minimum and maximum. TScore := Maximum Team Score in Range - ((HCap - minHC) x 2.99 / (maxHC - minHC)) (the value of 2.99 is the range of Team Scores within the Silver and Bronze handicap range. The Gold range is 1.99 and the Platinum range is .99. Team Points are earned based on the handicap earned in each age and gender group.